According to my family, I am the hardest person in the world to buy presents for. And I can kind of see how that's true. I'm just not really the kind of person who likes things, I guess - there are things that I enjoy, but I don't latch on to specific trends, at least not ones that make Christmas shopping easy. My mom thinks gifts should be fun and frivolous things you'd never get yourself, or things you want but don't need; I tend to ask for functional presents. Seriously, I'm happiest when I got new socks and deodorant in my stocking. So now, the question has been popping up: I've hit my 100 pound weight loss, so what am I going to do to for a reward? And to be honest, I'm not entirely sure. Whose philosophy should I subscribe to, mine or my mother's? Or maybe a bit of both? The last time I really thought about it was probably 99 pounds ago, and my response would likely have been "a cupcake." I do *not* want my reward to be food - it would go against everything I've been working for, and I'm not talking in terms of calories. I've been trying to redefine this in my mind for the past six months: food is not something I get for doing a good job, food is something that I need to fuel my body and keep it alive and moving. If I wanted a cupcake, I'd find a way to make it work - but I just don't want one. I also thought about buying some new clothes, but I feel myself leaning towards my mom's ideas of gift giving here - I kind of want something special, and the two-birds-one-stone doesn't feel celebratory enough. Bad pun aside, losing 100 pounds is huge. And I want to do something really wonderful to celebrate the fact that I am in a much better place right now than I was six months ago. I looked up "rewards for 100 pound weight loss" on Google, and most things that came up were food or clothes. Some people suggested a day at a spa, but I'm just not comfortable enough for that yet - I'll keep the idea on the back-burner for a reward for my 200 pound loss. Another suggestion said a nice piece of jewelry, but I already have a pearl necklace that I got from my parents for graduation that I never wear because it's so fancy. I had entertained the thought of a tattoo, and while it is definitely something that I'd like eventually, I think that right now with my 8k training, it's not the right time. A new tattoo is a giant wound that takes a few weeks and good care to heal properly, and I don't think all this running would be conducive to proper healing. I did some research on discussion boards and forums, and sweating isn't the major issue, it's clothing friction. All my running pants are long, and since I want the tattoo on my outer left thigh, I'd have to have some mighty short shorts to avoid clothes rubbing the tattoo. That is just not happening. So, what should I do? Suggestions? Ideas? The only thing that I am really certain about right now is also on my 101-in-1001 list: #57, donate to a cause I truly believe in. 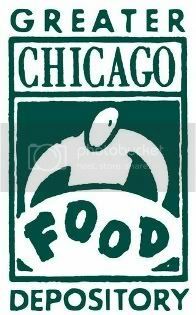 I want to help local food banks via the Greater Chicago Food Depository. Something that has really struck me during this journey is a sense of immense gratitude - I am constantly reminded that I have so much to be thankful for. I believe Jess said it best when she wrote on the subject back in November, essentially saying that we're all so fortunate to be in a position to afford to nourish our bodies and keep them active - with every meal, we choose what to eat, but some people have to decide if they can eat that day. According to the GCFD, they serve one out of every eight Chicagoans - including almost 23% of children here in the city. It's very humbling, and so I really want to give back in this way. Since you like functionality of gifts... and also don't like to be too frivolous... why don't you get yourself some sort of appliance that you probably wouldn't buy yourself that will make cooking healthy meals way easier or fun? Or since you're not into the spa thing... get your hair done? Get highlights or something and a haircut at a nice salon? I know you're not into the whole spa thing... maybe get a facial... they are amazing. I've only had two before... but they feel great. i remember someone posting that in honor of their loss, they would donate that amount of food (100 lb loss = 100 lbs of food) to a food pantry. that may feed two birds with one seed - your gratitude, helping a charity you care about, recognizing your milestone. most rewards are pretty me-centered; this would be other-centered. if it would mean to you what this reward is supposed to, i'd say that'd be a good way to go. What about doing something on your 101 list as a reward? Like planting your veggie garden (if you have the space), buying your blog url, tickets to a sporting event? And that's only part of the way down the list! Many of them could be great rewards! How exciting! NO FOOD! You should never celebrate your weight loss with food. That seems counter productive. Maybe you can try a hair appointment, like getting highlights or a new style. If you aren't into that maybe a keratin or strengthening treatment. You could also do something that you were afraid to do 100lbs ago, like ride a roller coaster, or try rock climbing or salsa dancing. Congrats again on such an amazing feat. I always say I am going to reward myself when I meet certain goals, but I seldom actually buy myself the reward.